Curated by Antonio Serna via Vizkult. 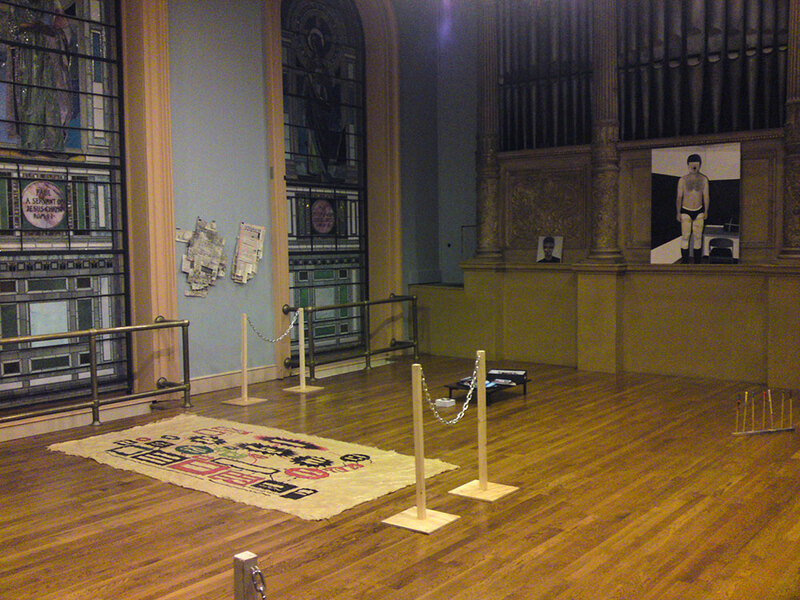 Exhibition was held at Judson Memorial Church in conjuction with The 5th Annual NYC Anarchist Book Fair and The 3rd Annual Anarchist Art Festival. Revolutions always result in the dissolution of power; the curious fracturing of what once appeared solid. No longer does the eye have a single focal point. Instead, it opens up like a wide-angle lens to reveal the millions of people at play within this movement of power. Or else it zooms onto a street corner, an alleyway, or a vacant lot for traces of a more discrete source of power. Even the outer lying suburbs are panned and scrutinized. In Chris Marker's 1977 film-essay 'A Grin Without Cat/Le fond de l'air est rouge,' the narrator asks "Why is it that images sometimes tremble?" In this case, it is the lack of a focal point that causes the eye to tremble. The eye is given no rest. The work in this exhibition shares the theme of power. Some exude this through the material choices and process, while others keep it contained like a battery. Still there are others who are more curious, testing, searching for the ever-illusive sources of discrete power. Hsiao Chen, Lacey Fekishazy, Pablo Gomez-Uribe, Kristen Kee, Julia Kul, Carlos Little, Rachel Mason, Lucas Michael, Andrew Prayzner, Colette Robbins, Begonia Santa-Cecilia, Ama Saru, Antonio Serna, and Jacob Zurilla. Left: "Pruno #1 (Master's Recipe)" by Carlos Little & Antonio Serna. 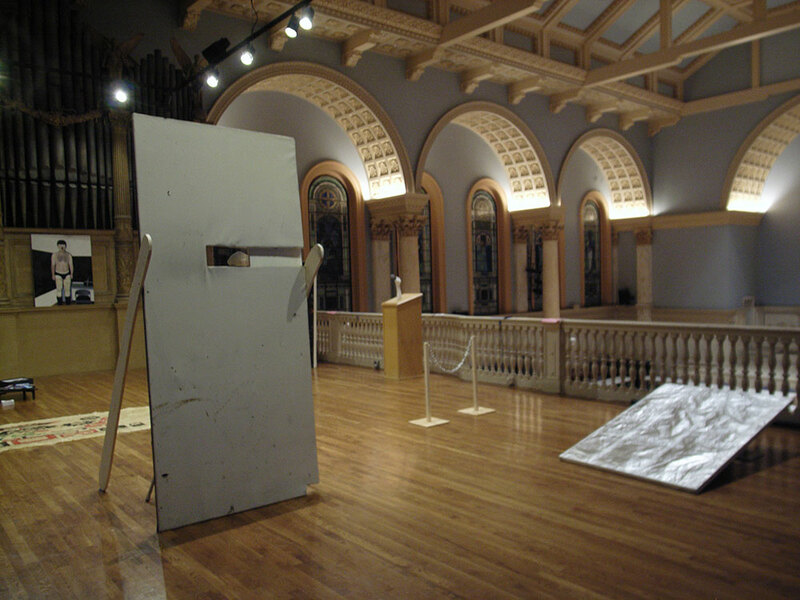 Right: "Untitled (Aluminum canvas)" by Begonia Santa-Cecilia. 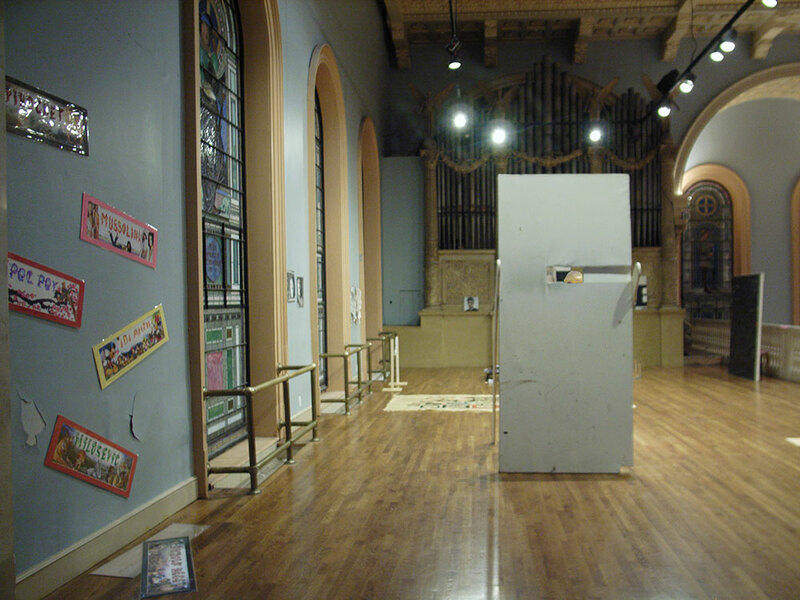 Left to right on the peripheral: "Untitled (Mules)" by Andrew Prayzner, "Untitled (black collage)" by Jacob Zurilla, "Podium with Microphone" by Rachel Mason. 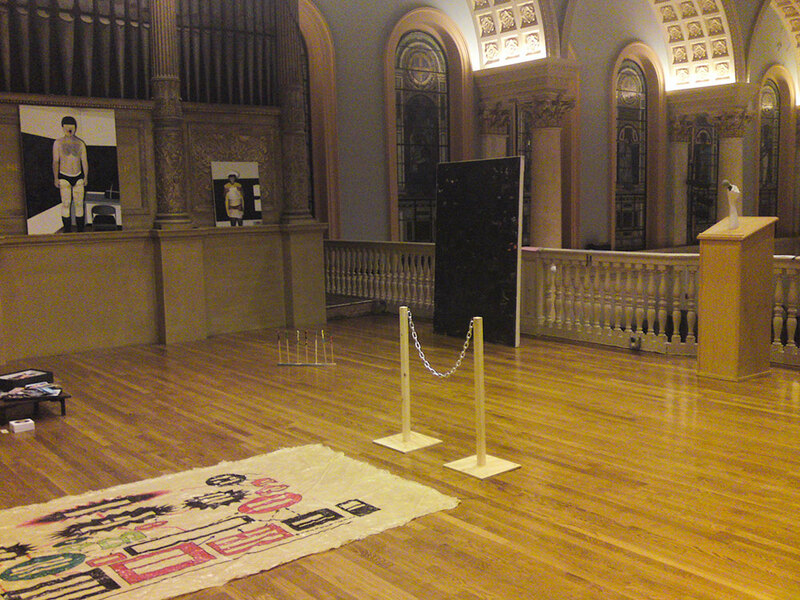 Clockwise on the center floor: "Sticks" by Lacey Fekishazy, "Chain" by Antonio Serna, "Untitled (Rubber Floor Piece)" by Kristen Kee, "At Ease" by Lucas Michael. 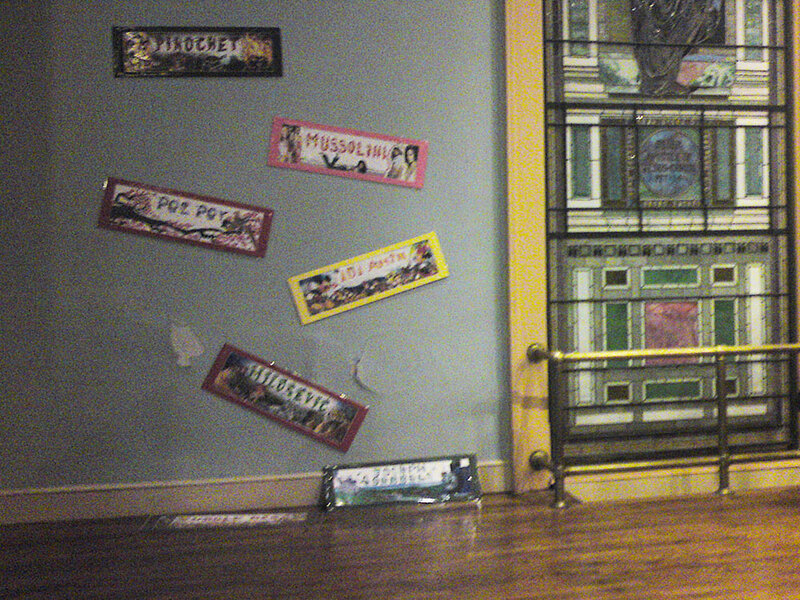 Left to right on the wall: "One Week of Accidents" by Pablo Gomes-Uribe, "Untitled (Mules)" by Andrew Prayzner. Floor left to right: "Untitled (Rubber Floor Piece)" by Kristen Kee, "Chain" by Antonio Serna, "At Ease" by Lucas Michael, "Sticks" by Lacey Fekishazy. Wall left to right: "Names" by Julia Kul, "Ken, & Colette" by Colette Robbins, "One Week of Accidents" by Pablo Gomes-Uribe. 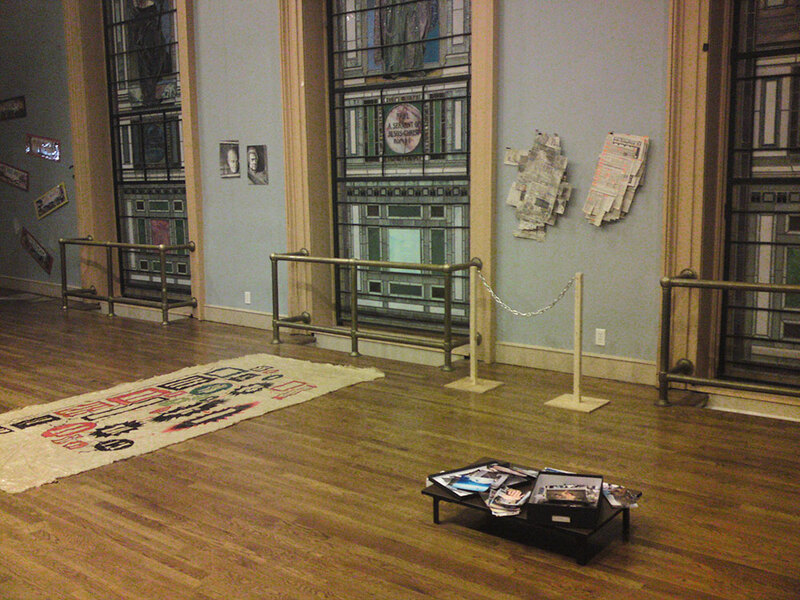 Floor left to right: "Untitled (Rubber Floor Piece)" by Kristen Kee, "Chain" by Antonio Serna, "At Ease" by Lucas Michael. 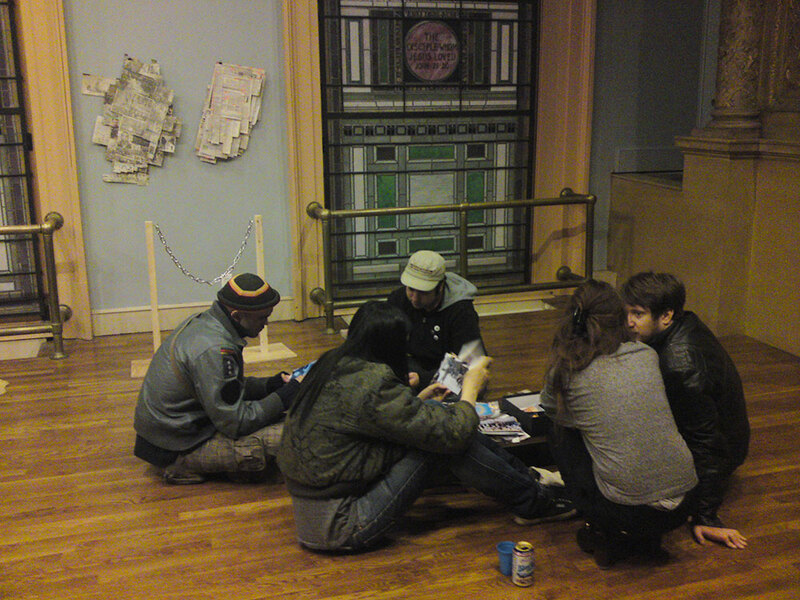 Visitors looked through the box of photographes from the war of "At Ease" by Lucas Michael. 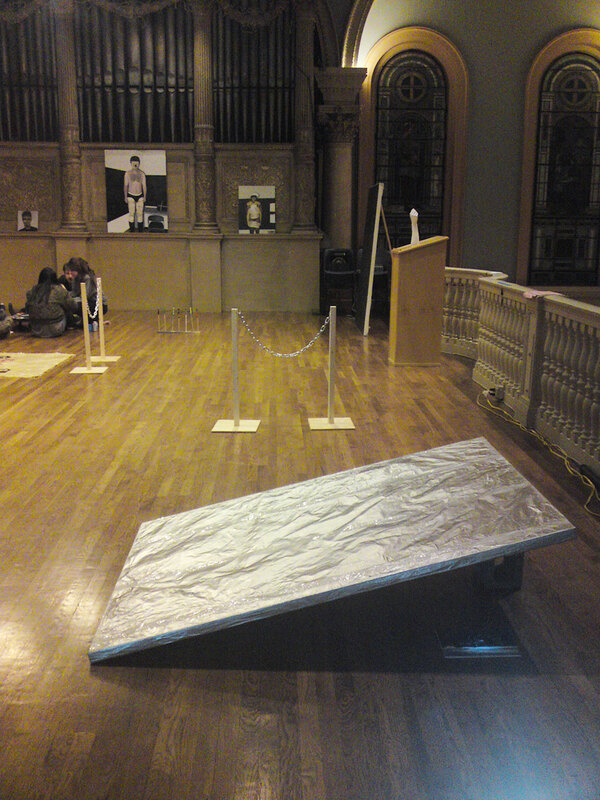 Foreground: "Chain" by Antonio Serna, "Untitled (Rubber Floor Piece)" by Kristen Kee. Center: "Pruno #1 (Master's Recipe)" by Carlos Little & Antonio Serna. 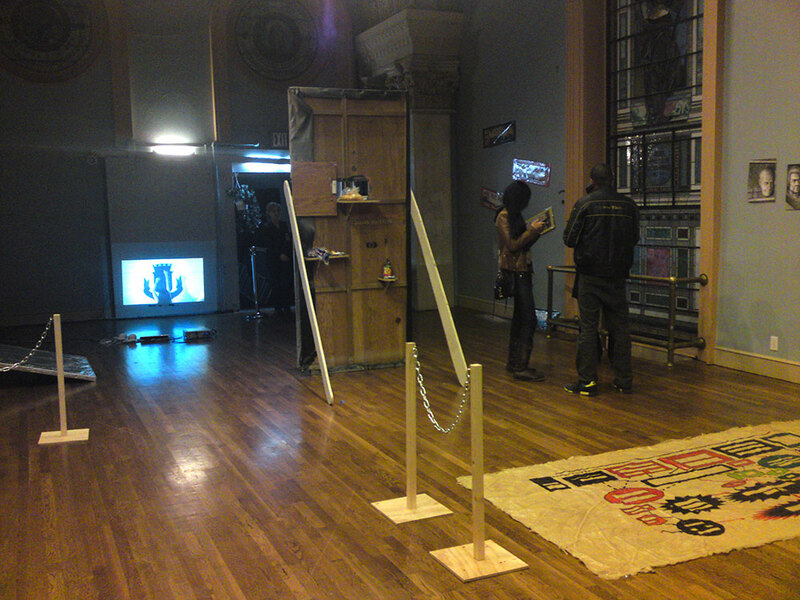 Back wall: Video projection of "Insistence" by Ama Saru. 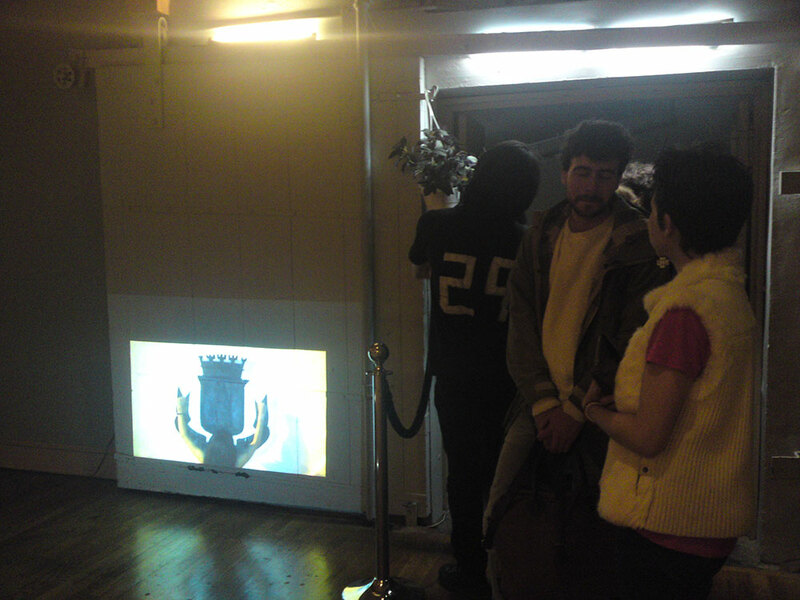 Left: Video projection of "Insistence" by Ama Saru. Center by the entrance: "Untitled (Hanging Plant)" by Hsiao Chen. 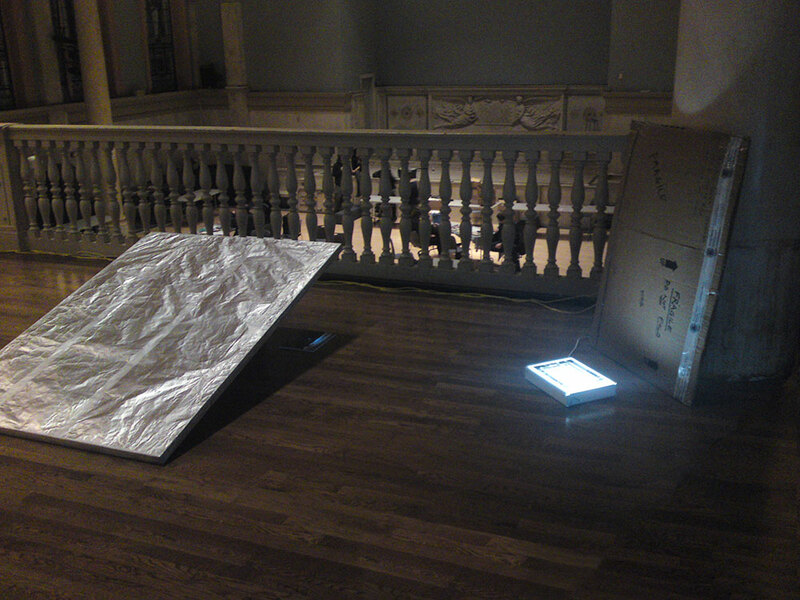 Left: "Untitled (Aluminum canvas)" by Begonia Santa-Cecilia. Right: "Safe" by Antonio Serna. Back wall: "Untitled (Mules)" by Andrew Prayzner. Floor clockwise from the left: "Untitled (Rubber Floor Piece)" by Kristen Kee, "At Ease" by Lucas Michael, "Sticks" by Lacey Fekishazy, "Untitled (black collage)" by Jacob Zurilla, "Podium with Microphone" by Rachel Mason, "Chain" by Antonio Serna, "Untitled (Aluminum canvas)" by Begonia Santa-Cecilia. Left: "Names" by Julia Kul. Right: "Pruno #1 (Master's Recipe)" by Carlos Little & Antonio Serna.